Following an agonizing string of rumors and spy shots, Audi has officially revealed the RS3 Sportback - and it's everything we hoped it would be. 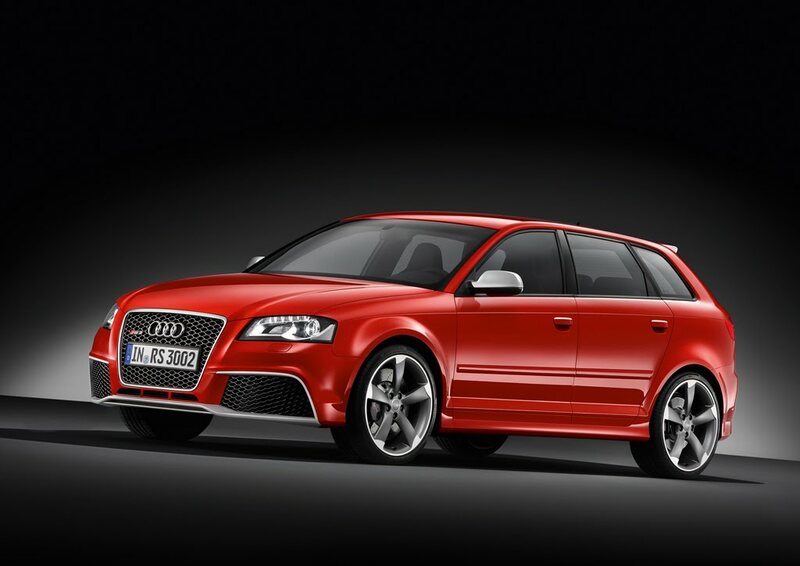 Featuring a 2.5-liter five-cylinder engine (à la TT RS) mated to a seven speed S-tronic transmission and quattro all-wheel drive, the RS3 is good for 340 horsepower and 332 lb-ft of torque. Enough for a 0 to 62 mph sprint in just 4.6 seconds, on to an electronically limited top speed of 155 mph. Proof that big performance can come in a small package. Under the hood, the RS3's 2.5-liter five-cylinder is the same 2010 International Engine of the Year currently found in the Audi TT RS. 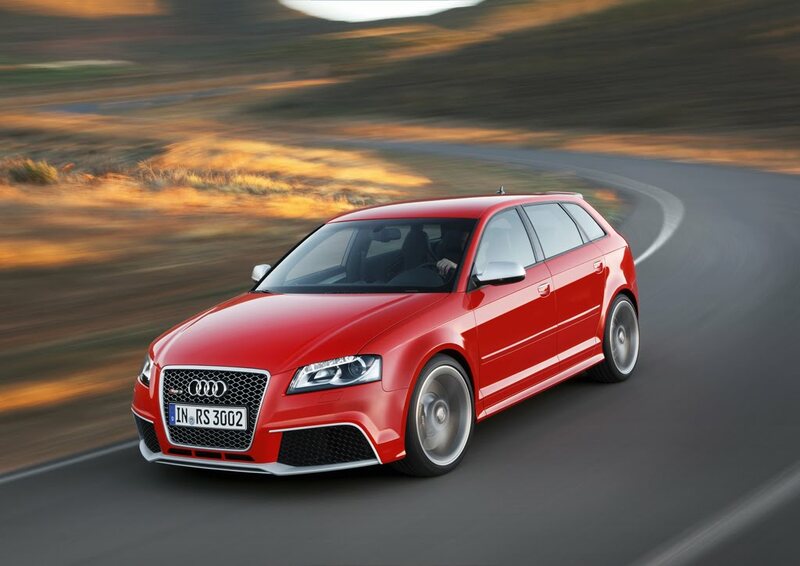 Helping this five-pot unleash all 340 horses is a large turbo, spooling a face-mashing 17.4 PSI (1.2 bar) of boost. A long, flat torque curve makes all 332 lb-ft of torque available from 1,600 - 5,300 RPM on to a 6,800 RPM red line. 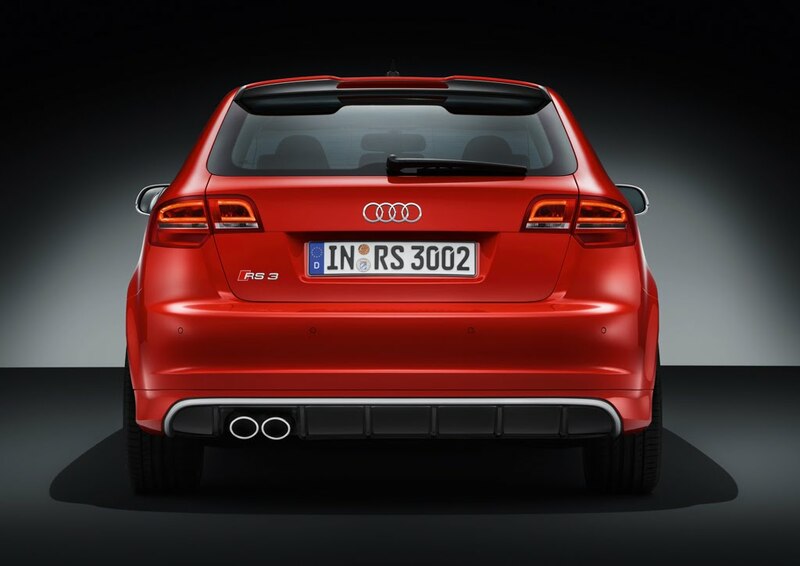 And perhaps best of all is the unmistakable five-cylinder rhythm and throaty exhaust growl, which can be accentuated by opening a special exhaust sound flap when driven in S-mode. 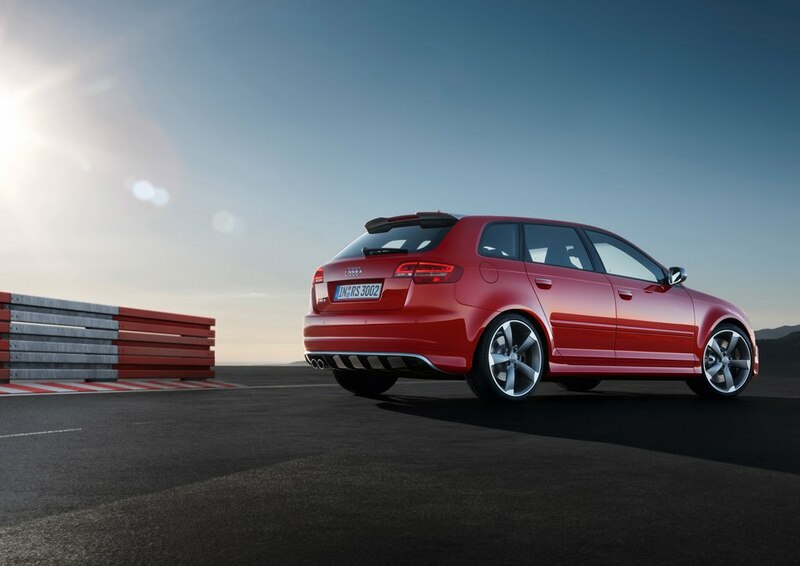 To deliver RS-worthy handling, the Audi RS3 Sportback features a noticeably wider track than its A3 counterpart (60.16 inches front/61.57-inch rear) and is 25mm (.95 inches) lower thanks to a revised suspension, coil springs and shocks. 19-inch titanium-look wheels are standard, as are 370mm (14.57-in.) front and 310mm (12.20-in.) rear, internally ventilated disk brakes squeezed by four-piston fixed calipers. Exterior styling reveals hardly any surprises. The RS3's aggressive TT RS-style lower front fascia and flared fenders were both revealed in the most recent spy shots. Inside, are Fine Nappa leather sport seats, piano black or aluminum inlays, a flat-bottom sport steering wheel and plenty of RS-badging. 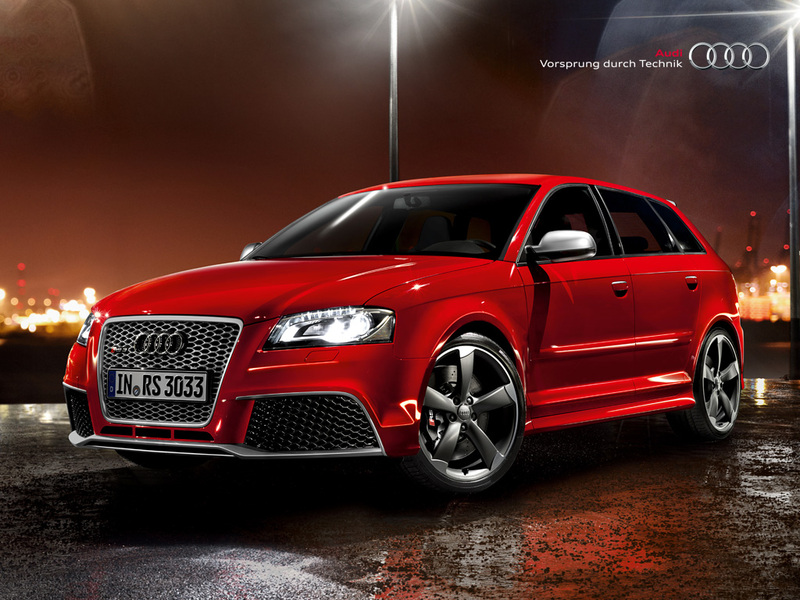 Look for deliveries of the RS 3 Sportback to begin in early 2011 with a base price in Germany of 49,900 euros. The full press release can be found following the hi-res photo gallery below. Blazing performance, compact size. 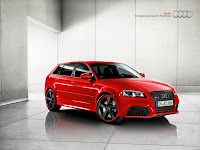 Audi has added a new model to its dynamic RS series: the RS 3 Sportback. 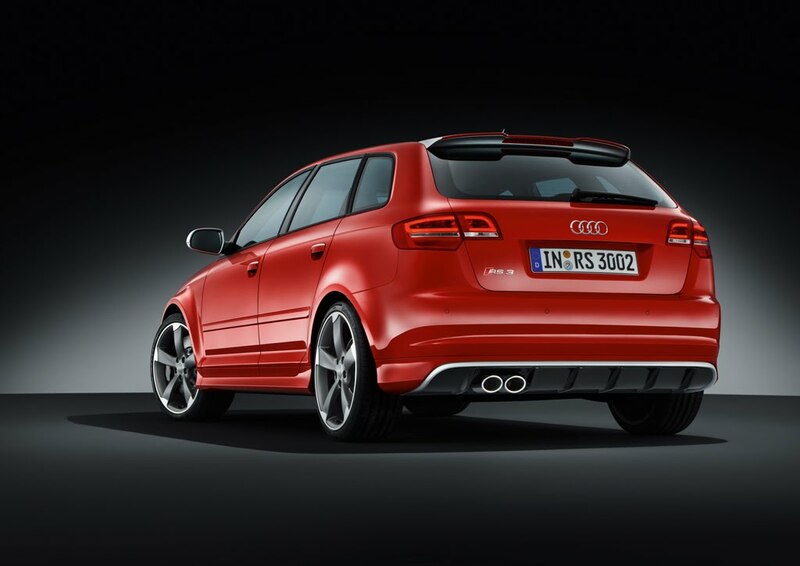 In the great tradition of the brand, its engine boasts five cylinders and turbocharging technology. From a displacement of 2.5 liters come 250 kW (340 hp) of power and 450 Nm (331.90 lb-ft) of torque, with an average fuel consumption of just 9.1 liters of fuel per 100 km (25.85 US mpg). 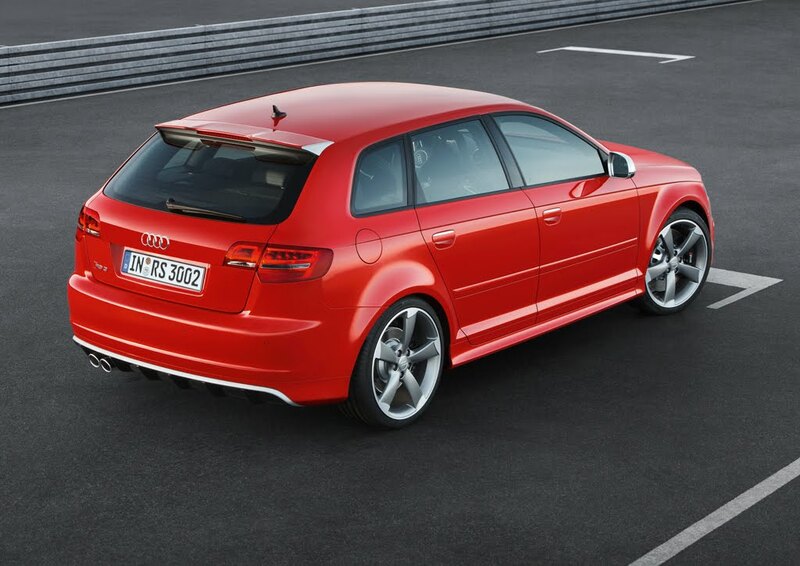 Power is transmitted to the road via a seven-speed S tronic and quattro permanent all-wheel drive. 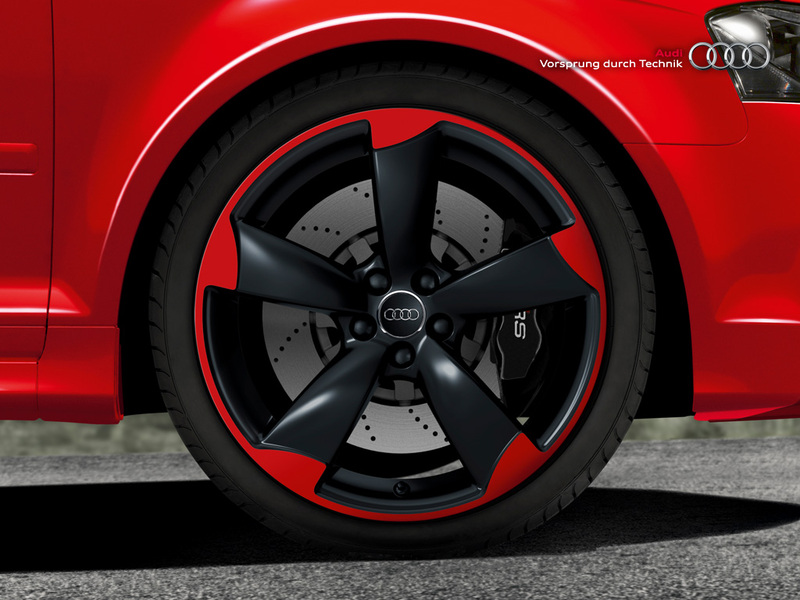 19-inch wheels and fenders made of carbon fiber reinforced plastic (CFRP) underscore the Audi RS 3 Sportback’s position of distinction. Each Audi RS model represents the pinnacle of its model line – the RS 3 Sportback, developed by quattro GmbH, now brings this dynamic philosophy to the compact category. 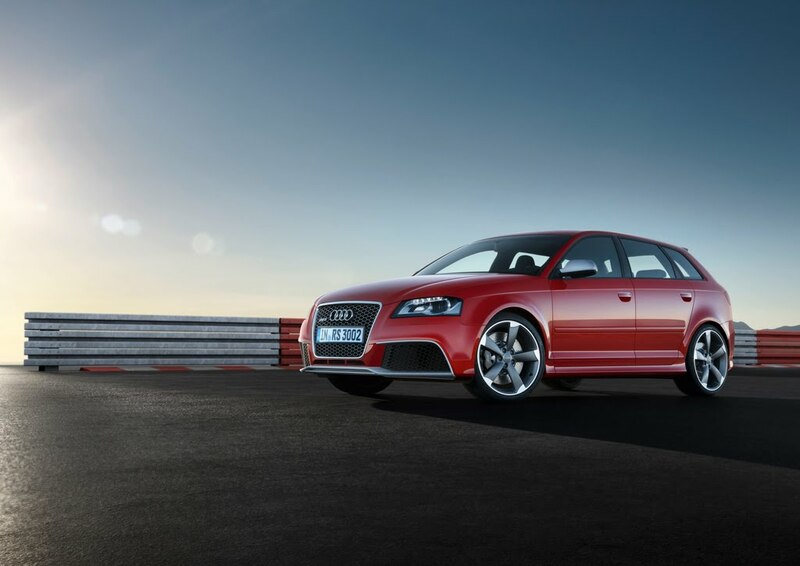 It rockets from a dead stop to 100 km/h (62.14 mph) in 4.6 seconds – a performance figure unrivaled by the competition. 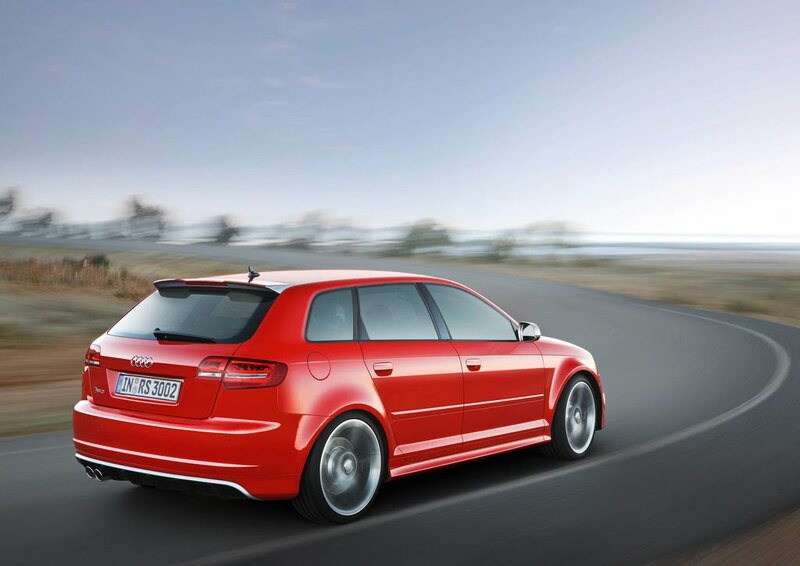 Top speed is electronically limited to 250 km/h (155.34 mph). Even so the compact car, weighing in at only 1,575 kilograms (3,472.28 pounds), uses on average just 9.1 liters of fuel per 100 km (25.85 US mpg) and emits 212 g CO2 per km (341.18 g/mile). This efficiency is due in large part to a delivery-on-demand oil pump and a regenerative system that recovers energy as the car decelerates. 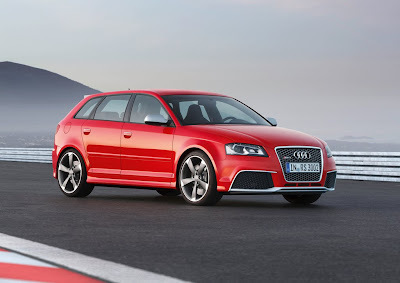 The 2.5-liter engine in the RS 3 Sportback will thrill passengers thanks to its tremendous pulling power and its voracious revving up to 6,800 rpm. The guttural roaring and growling, backed by the signature rhythm of the five-cylinder firing order make up the classic Audi soundtrack. A sound flap in the exhaust branch intensifies the sound even further. The flap is controlled via the standard Sport button, which also varies the engine response. 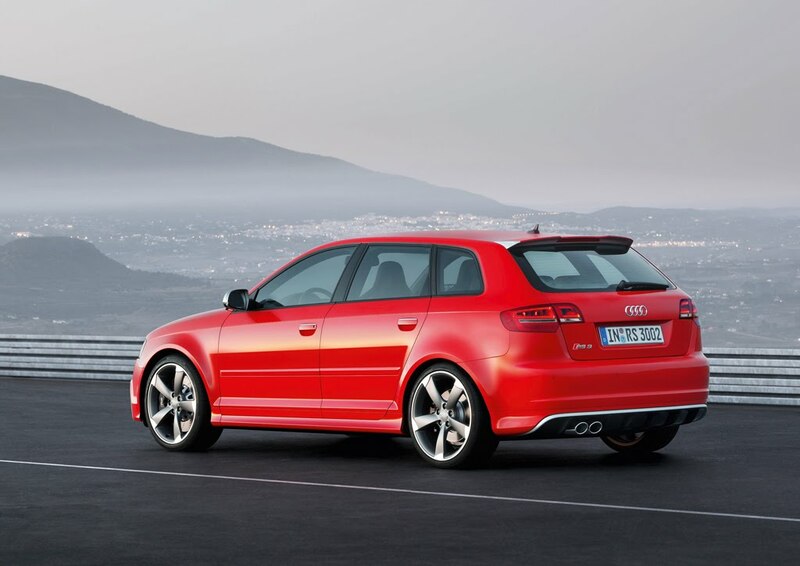 Powerful five-cylinder engines have a long legacy at Audi. In the 1980s, racing cars and production cars used them to edge out the competition. 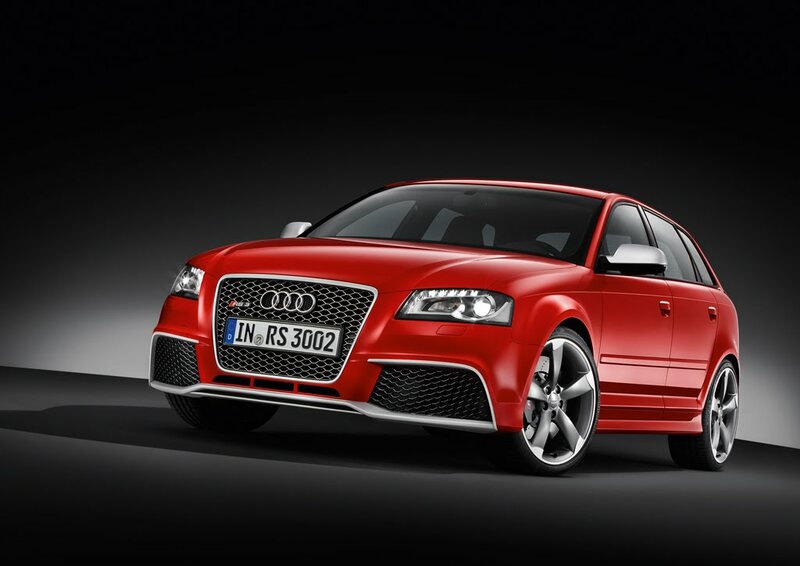 Even the first Audi RS model, the 1994 RS 2, had a five-cylinder engine. 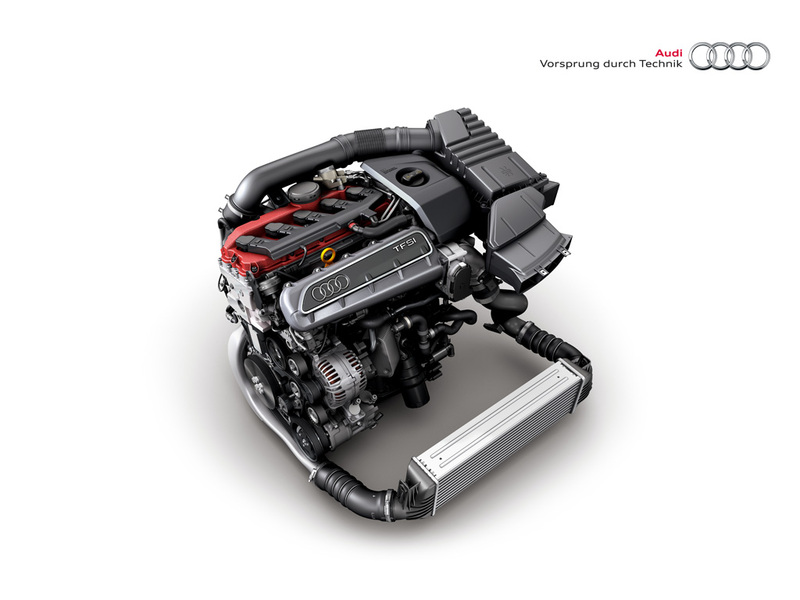 The 2.5-liter unit, already part of the TT RS specifications, now redefines the state of the art, having recently been named “International Engine of the Year” by a high-ranking jury of automotive journalists. The 2.5 TFSI delivers 250 kW (340 hp) from a displacement of 2,480 cc: a specific power output of 100.8 kW (137.1 hp) per liter. The maximum torque of 450 Nm (331.90 lb-ft) is readily available at the low end of the rev range, around 1,600 rpm, and remains constant up to 5,300 revolutions. These general parameters yield excellent acceleration and elasticity values. Just 49 centimeters (19.29 inches) in length, the five-cylinder unit is ultra-compact, tipping the scales at a mere 183 kilograms (403.45 pounds). The crankcase is made of vermicular-graphite cast iron, a high-strength yet lightweight material. 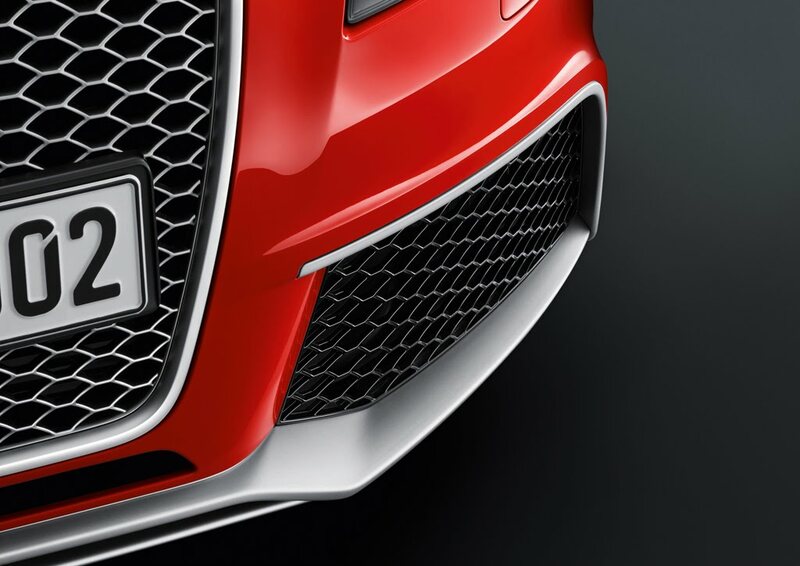 Audi is the first car maker to use this material in a gasoline engine. Perfectly placed reinforcements further enhance the block’s loadability. 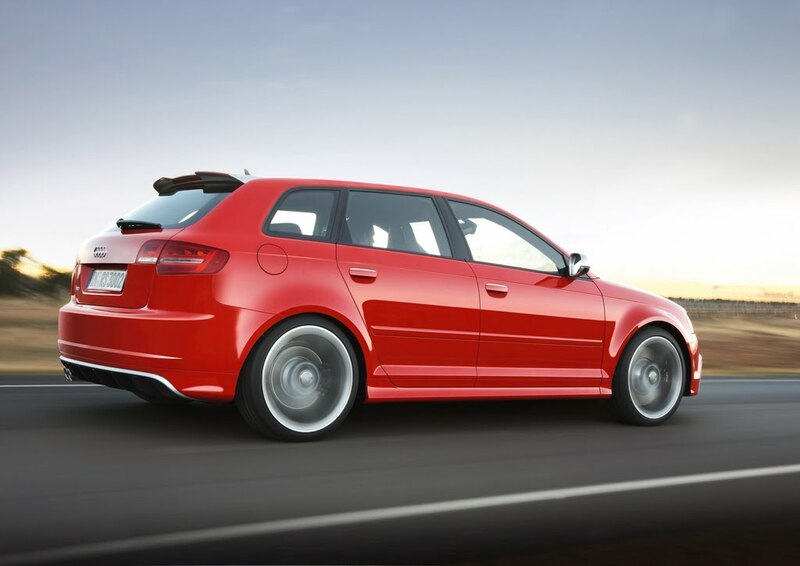 The lightweight-design concept keeps the Audi RS 3 Sportback’s weight in check and pays off big in terms of axle‑load distribution and, ultimately, handling. The large turbocharger generates up to 1.2 bar of boost pressure. The intercooler downstream achieves an efficiency rate of over 80 percent. 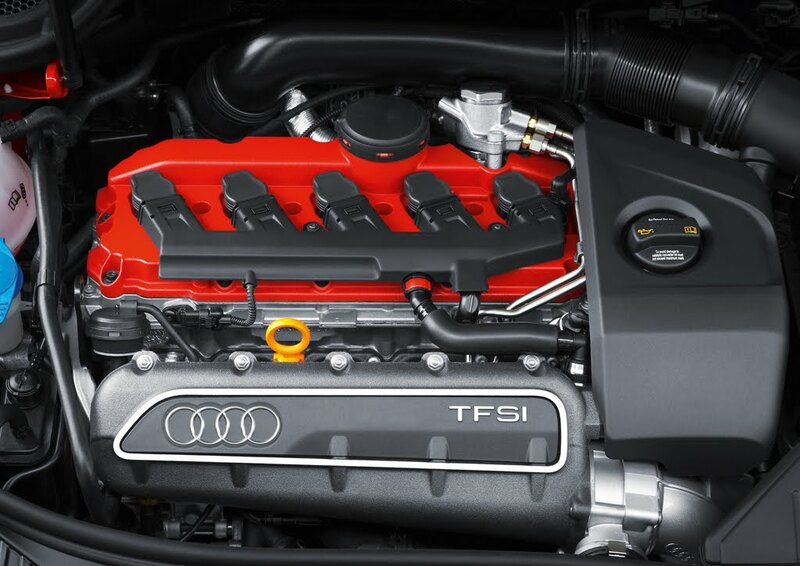 Like all Audi gasoline turbos, the 2.5 TFSI combines turbocharging technology with FSI direct injection. The marriage of these two technologies facilitates a high compression ratio (10.0:1) along with a correspondingly high efficiency ratio. Flaps in the intake tract mix the air as it flows in. The two camshafts, each adjustable by 42 degrees of crankshaft rotation, also enhance the efficiency of the mixture formation. The compact seven-speed S tronic transmits power from the five-cylinder engine via three shafts: one drive shaft and two output shafts. 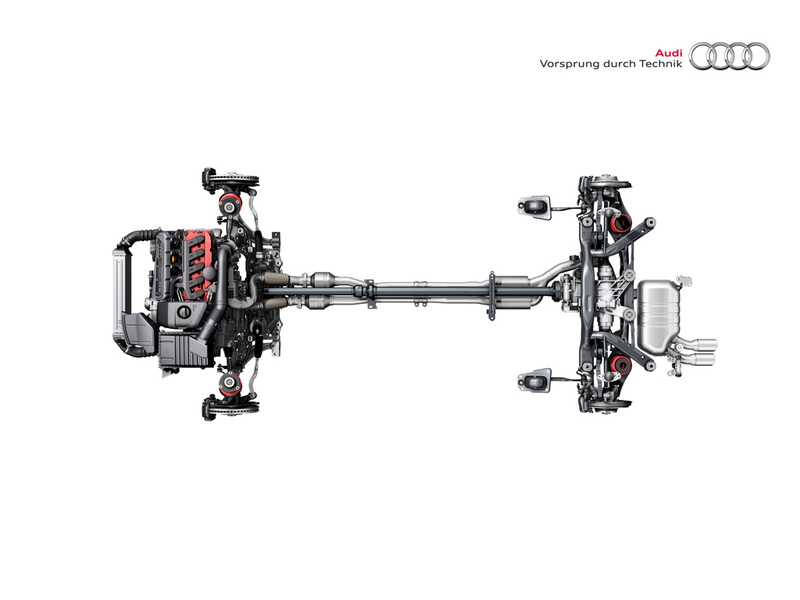 Like all dual-clutch transmissions, it comprises two transmission structures. The shifting process is extremely smooth, taking place in hundredths of a second as the clutches switch, with no perceptible interruption of pulling power. Seventh gear is very tall – a measure that reduces fuel consumption. The driver can operate the seven-gear S tronic in two automatic modes and one manual mode. Gears are shifted using the paddles on the steering wheel or the selector lever. The launch control system manages the sprint from a dead stop, furnishing explosive turbo power with minimal tire slip. 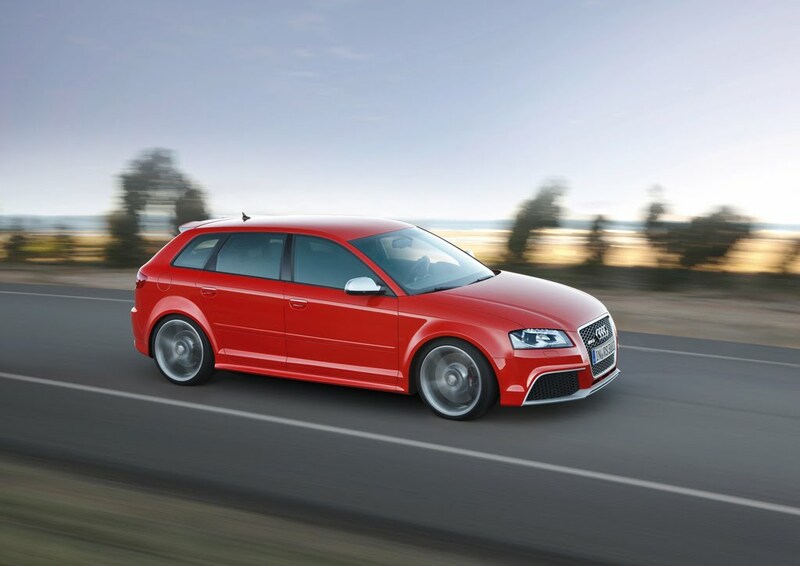 Delivering power to the road with effortless ease, the quattro permanent all-wheel drive grants the RS 3 Sportback traction, dynamics, and stability. Its central component is an electronically controlled multi-plate clutch, mounted at the end of the propeller shaft to achieve a favorable axle load distribution. Located in its interior is a plate package bathed in oil. Thanks to quattro, the propulsive power can be distributed to each axle as needed. Whenever slip occurs at one of the axles, an electric pump intervenes at lightning speed to increase the oil pressure. The pump presses the clutch plates together in a continuous fashion, thereby permitting the torque to be redirected accordingly. Thanks to a powerful accumulator, this process takes just a few milliseconds. 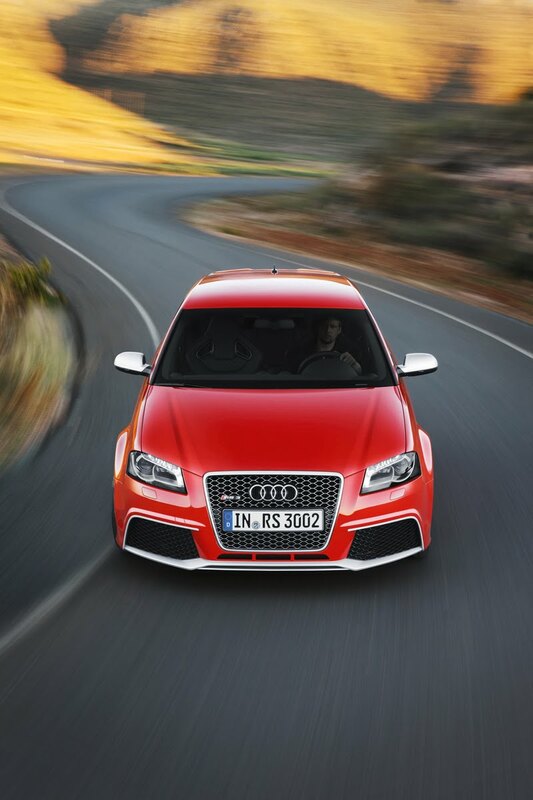 The stiff body lays the cornerstone for the RS 3 Sportback’s precise handling; the chassis is what makes it happen. 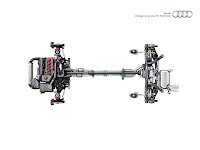 The four-link rear suspension – with a track measuring 1,528 millimeters (60.16 inches) – is anchored to a subframe and features high-strength-steel control arms that allow it to handle longitudinal and lateral forces separately. Widened to a 1,564-millimeter (61.57-inch) track, the front suspension is a McPherson strut construction, also with a separate subframe. Key components of the construction are made of aluminum. Thanks to its electromechanical drive, the rack-and-pinion steering is highly efficient, with a sporty-direct gear ratio of 16.2:1. 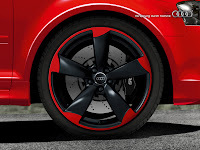 Coil springs and redesigned shock absorbers provide the vertical support. 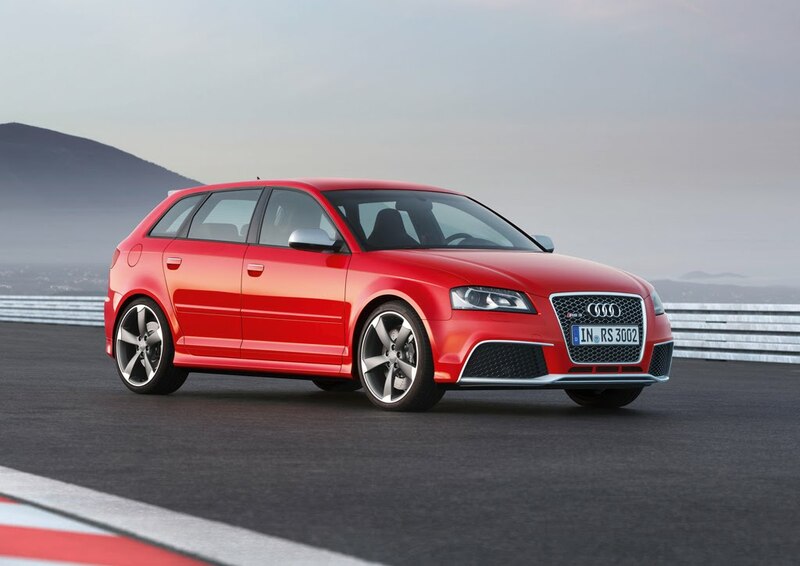 The sports suspension lowers the body of the RS 3 Sportback by 25 millimeters (0.98 inch) compared with the A3. The new range-topping model in the A3 series boasts 19-inch cast aluminum wheels fitted with 235/35 series tires at the front and 225/35 at the rear. The wheels come standard with machine-polished titanium-look styling, but are optionally available in black with a red rim flange. The internally ventilated disks measure 370 millimeters (14.57 inches) in diameter at the front and 310 millimeters (12.20 inches) at the rear. The front friction rings are perforated for maximum heat dissipation. 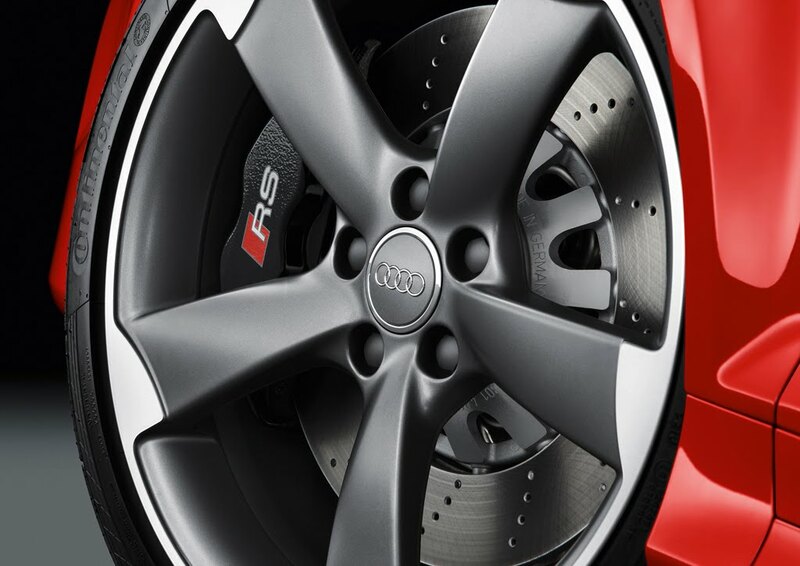 They are connected by hollow pins to the aluminum brake disk covers, which are encircled by four-piston fixed calipers painted a high-gloss black and bearing RS logos. The electronic stabilization program (ESP) features a Sport mode and can be switched off entirely. 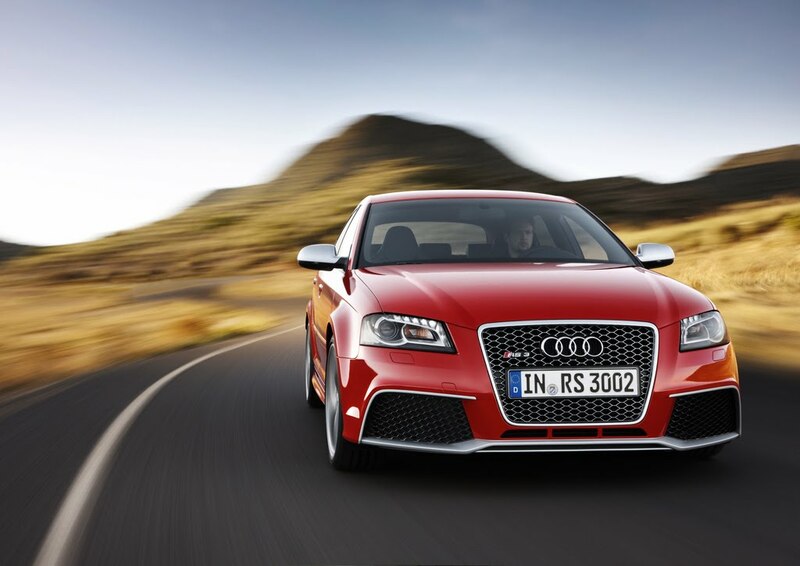 Precisely guided by its responsive steering, the RS 3 Sportback eagerly takes to curves and exits them with agility, stability, and serenity. The stability limit is extremely high, an effortless mastery that rounds off the character of this powerful compact car. 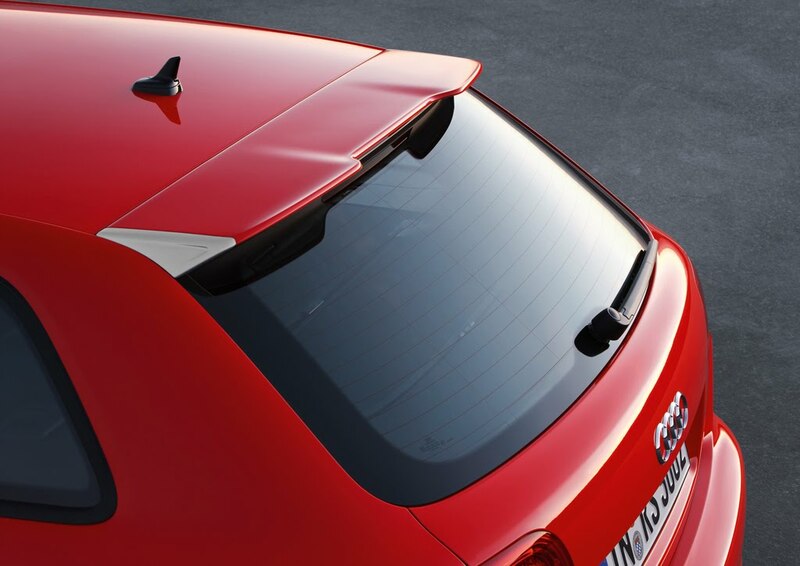 The new top-of-the-line model in the A3 series hints at its explosive potential from the very first glimpse. Together with the xenon plus headlights, the front apron, the anthracite single-frame grill with diamond-patterned styling and the air intakes cut a distinctive figure. The side view is dominated by the flared front fenders made of carbon‑fiber‑reinforced plastic (CFRP), prominent sill panels, exterior-mirror casings in matt aluminum look and a large roof spoiler. A high-gloss black diffusor insert and two elliptical exhaust tailpipes on the left accentuate the styling at the rear. 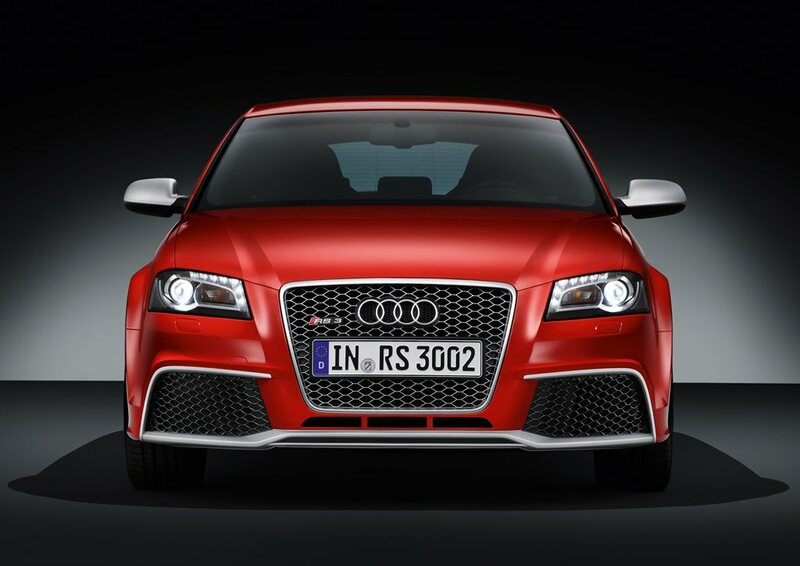 RS 3 badges adorn the single-frame grill and the rear hatch. 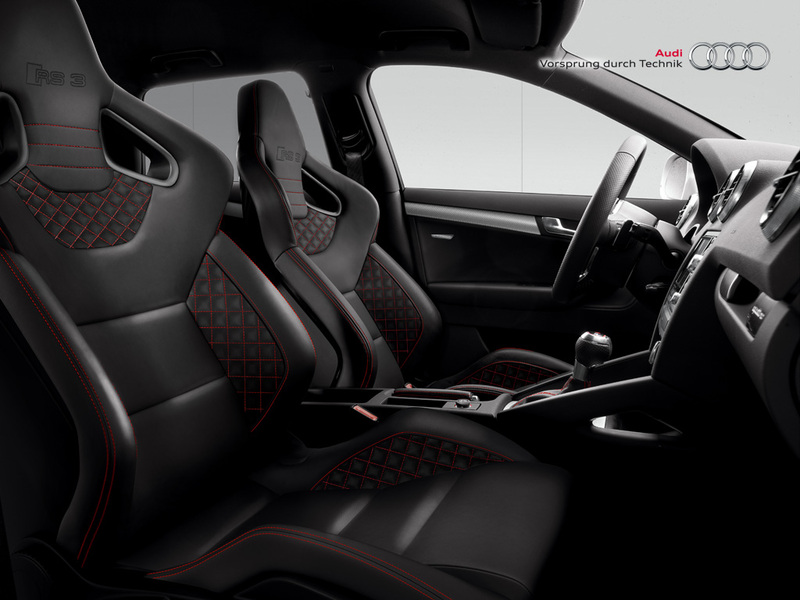 The dynamic style is matched in the interior, entirely black and sporting a number of RS 3 logos. The sports seats are upholstered in Fine Nappa leather with silver contrasting stitching; the inlays gleam in Piano finish black or the new Aluminum Race look; the leather multifunction sports steering wheel is flat-bottomed. The selector lever and instruments are specially designed. The driver information system can display the boost pressure and oil temperature as well as a lap timer. 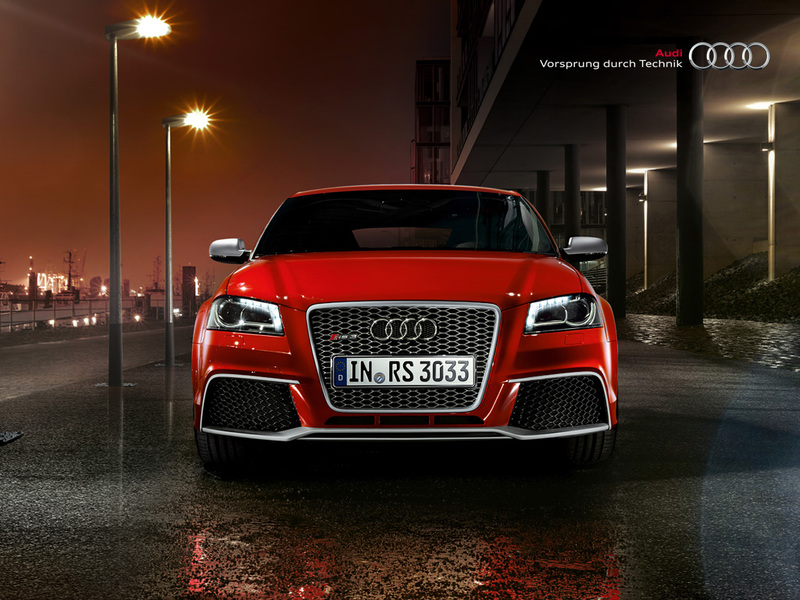 The RS 3 Sportback comes with an array of standard equipment including the Sport button, rear parking system, climate control, chorus radio system, and xenon plus headlights with LED daytime running lights. Audi offers customers a range of optional features: front bucket seats, roof rails in matt aluminum look, and styling packages in black or matt aluminum. Five exterior colors are available, plus an unlimited selection of custom paint finishes. The new top-of-the-line model in the A3 series is already the fourth Audi model to be built at Audi Hungaria in Győr, where it is rolling off the assembly line alongside the TT Coupé, the TT Roadster and the A3 Cabriolet. 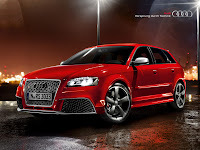 Deliveries of the RS 3 Sportback will begin in early 2011. The base price in Germany will be 49,900 euros.